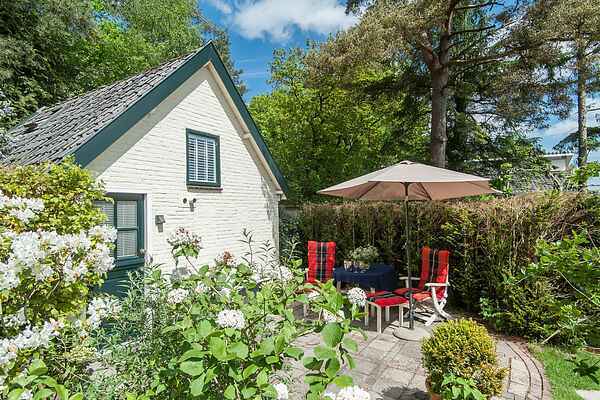 Detached holiday home, located on the edge of the Schoorl forest. Behind the holiday home there is a small brook. You will enjoy the lovely wooded surroundings of your residence. Within fifteen minutes by bike, you are at the cosy family beach of Schoorl. The cosy holiday home has a cosy living room annex kitchen on the ground floor. Here you will also find the bathroom with shower facilities. The cosy bedroom is on the first floor. There is a nice terrace where you can enjoy the sun. Although the holiday home is located on the estate of the owner you'll enjoy complete privacy and you have your own entrance. Because of the ditch behind the house children younger than 5 are not allowed. Schoorl is situated in beautiful surroundings. The Schoorlse Duinen visitors' centre is located on the edge of the dune area. The Schoorlse Duinen are the highest of the Netherlands, so you will have plenty of room to climb, to slide down and just go for a walk. The children will love the play forest of Zandspoor. There is a place to swim, a little train to move the sand and lots of little place to go play hide and seek. Climbing in the trees is also possible, or find out how high you can jump! Just outside the center of Schoorl cycling or walking trips start. This is a great way to discover some nice seaside resorts of North Holland, like Bergen or Hargen aan Zee.